Figure 1 shows the components of a Distributed Denial of Service (DDoS) attack. The attacker uses a command and control network to instruct large numbers of compromised systems to send traffic to a designated target with the aim of overwhelming the target infrastructure and denying access to legitimate users. This article will show how the standard sFlow monitoring built in to most vendor's network equipment can be used to rapidly detect DDoS attacks and drive automated controls to mitigate their effect. This case study is based on a data center network consisting of approximately 500 switches and 30,000 switch ports and the charts show production traffic. 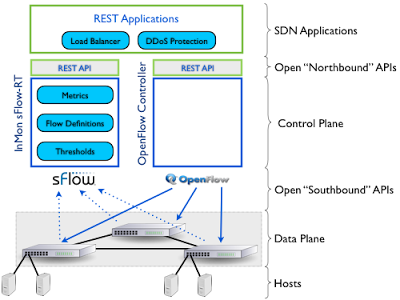 This network was used as a testbed for developing the sFlow-RT analytics engine and the resulting solution is now used in production. Figure 1 shows a typical DDoS attack, consisting of sustained traffic levels of over 5M packets per second (30 Gigabits per second) that last for many hours. The attacks are intended to saturate the links to the data center and deny access to the servers hosted there. Note: This chart is from an early sFlow-RT prototype and the drop outs are spurious. Performance aware software defined networking describes the basic elements of the DDoS mitigation system. The sFlow measurements from all the switches are sent to the sFlow-RT analytics engine which provides real-time notification of denial of service attacks and information about the attackers and targets to the DDoS protection application (a variant of Python script shown in the article). The DDoS protection application issues commands to the controller which communicates with the switches to eliminate the DDoS traffic. In this specific example, the controller doesn't actually use OpenFlow to communicate with the switches - instead scripts automatically login to the switch CLI to issue configuration commands that cause upstream routers to drop the traffic (see null route). Figure 4 shows results from an early prototype controller. The chart is interesting because it shows five separate DDoS attacks occurring within the span of three minutes. Each attack is being stopped in under 30 seconds - this is fast enough that the attacks don't fully evolve, peaking at 3 million packets per second, rather than the typical 5+ million packets per second. Note: It takes the attacker some time to fully mobilize their network of compromised hosts - if the defense actions can be deployed faster than the attacker can deploy their resources then the effect of the attack is largely eliminated. Figure 5, from SDN and delay, describes the components of response time in the control loop. Further tuning to reduce the measurement delay and configuration delay significantly improved effectiveness of the controller. Figure 6 shows the performance of the improved controller: the response time to detect an attack and implement a control is around 4 seconds, the peak traffic cut by two thirds, and all the traffic is eliminated in approximately 10 seconds. 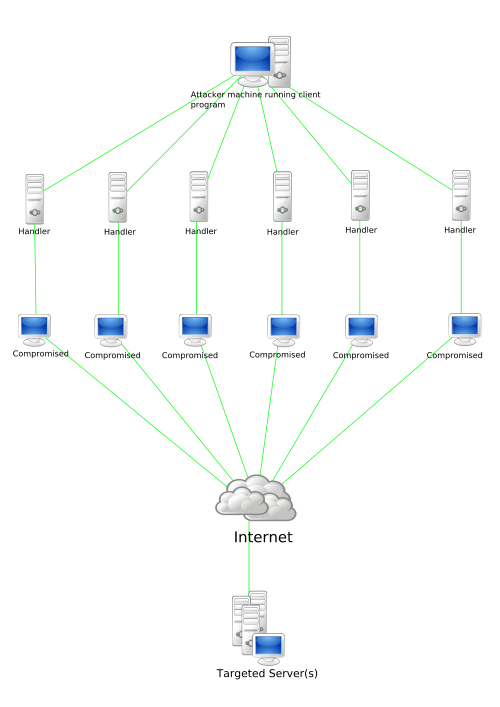 This denial of service mitigation example demonstrates sFlow's unique suitability for control applications. More broadly, sFlow provides the comprehensive measurements needed to drive a variety of resource allocation and load balancing applications, including: SDN and large flows, ECMP load balancing, Load balancing LAG/ECMP groups, and cloud orchestration. In future, expect to see sFlow-based performance awareness incorporated in a wide range of orchestration platforms, leveraging existing infrastructure to increase performance, reduce costs and ensuring quality of service - ask vendors about their plans. How do you differentiate a legitimate traffic surge from a DDoS attack in sFlow with regards to setting of threshold values? The UDP flood attacks described in this article generate orders of magnitude more packets/second than you would normally see on the network, so setting a threshold is not very difficult. A conservative approach (to eliminate false positives) is to determine the level of UDP traffic that would saturate WAN bandwidth, or disrupt services, and set a threshold to trigger at that level of traffic. Alternatively, you could look at normal UDP levels on the network and set a threshold 10 times the peak values you expect to see. There are a number of DoS related articles on this blog that look at different attacks and mitigation strategies that you might find useful. I am very grateful for your response sir, however, I have one more question. How do I convert the packet size in sFlow to bit/sec or I should rather say, what is the size of each packet in bytes? Thank you for your candid and timely support. If this is the case, it means the size of each packet = 750 bytes per second. Is this correct and if yes, is it the case always? Defining Flows describes the parameters available for defining sFlow-RT flows. Change value:'frames' to value:'bytes' to track traffic in bytes/second. sFlow-RT calculates the bytes/second value based on the size of each packet sample. please can i see the algorithm for the detection and mitigation that will support sflow ..